Portland home builders are paying attention to the growing trend of creating a connection between the interior and exterior of a home. This indoor/outdoor connection allows homeowners to enjoy lovely views and landscaping year-round, increases resale value, and boosts the amount of living space on their property. Whether you wish to renovate your home to maximize the indoor/outdoor connection, or are looking for a Portland, Oregon home builder that can create that connection for you, here are some ideas to aid in understanding this trend. Not surprisingly, windows can instantly create a connection between the interior and exterior of your home. However, the placement and size of a window can greatly affect that relationship. When renovating or choosing a Portland home builder, remember that side-by-side windows, around the corner windows, and floor to ceiling windows add a modern touch to the indoor/outdoor connection. Place windows where they can create the greatest impact, whether taking in a lovely view of Mount Hood or framing your beautifully landscaped garden and the towering evergreens above. And do not underestimate the practicality of sliding glass windows, which are now available in modern designs that blend functionality and style. Outdoor living rooms are increasingly popular, and feature everything from fire pits and vaulted patio ceilings to audio systems and refrigerators. The outdoor furniture is higher quality and meant for habitual use, rather than just the summer season. Portland home builders know that the weather is unpredictable, so screened porches and sunrooms with large windows create the same outdoor living experience with a uniquely Pacific Northwest practicality. An outdoor living room adjacent to a great room can also double your entertaining space. Consider multiple sliding doors, French doors, or pivoting glass options in order to simulate entryways. And using the same flooring materials inside and outside can create a seamless transition. This uninterrupted flow can be furthered by keeping both spaces at the same level, rather than split by stairs or slopes. The indoor/outdoor connection is not exclusive to shared areas of your home. The master bedroom or suite can have a private garden as well. Create natural boundaries with shrubs or bamboo and add a bubbling water feature for an immediate retreat from everyday chaos. Many people keep their bedroom windows and doors shut in the name of privacy, yet a separate garden or sitting area makes it easier to let in natural light and keep the door open for a cool breeze. 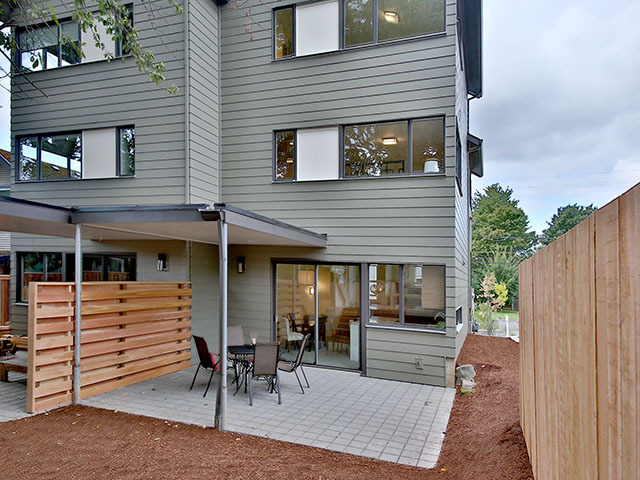 To find out how Portland, Oregon home builders are creating the indoor/outdoor living connection in the Pacific Northwest, check out H. Hudson Homes upcoming homes in the area.